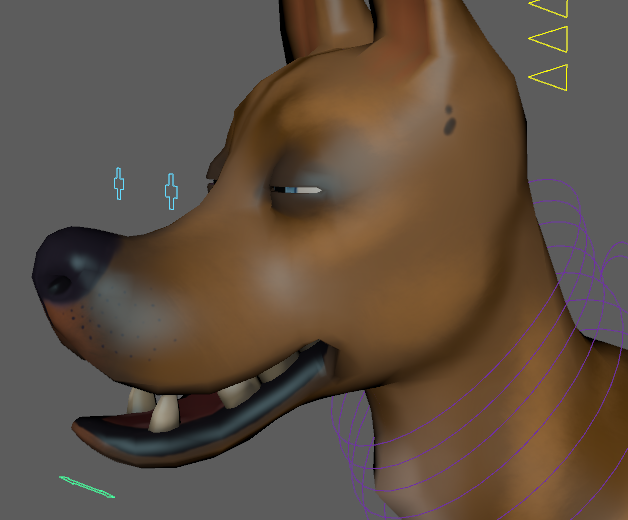 A friend of mine started fleshing out an idea he has for a dog-walking game, in which the object is to keep control of a bunch of goofy dogs. 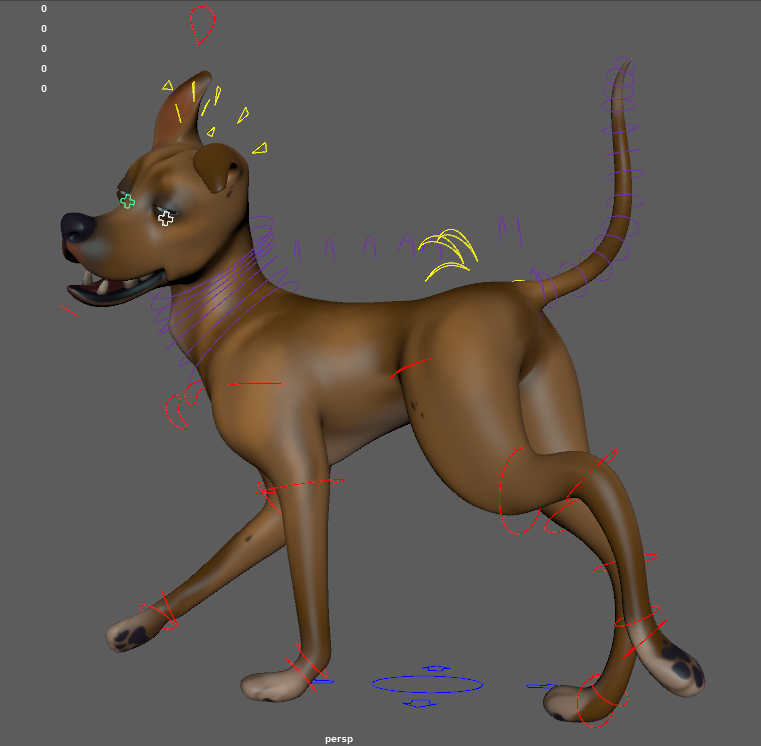 For this, he needed at least one dog model rigged up and ready to go, so I got to sketching out a few ideas. He wanted a very soft, toony look to the characters, so I took the opportunity to try some different shapes. 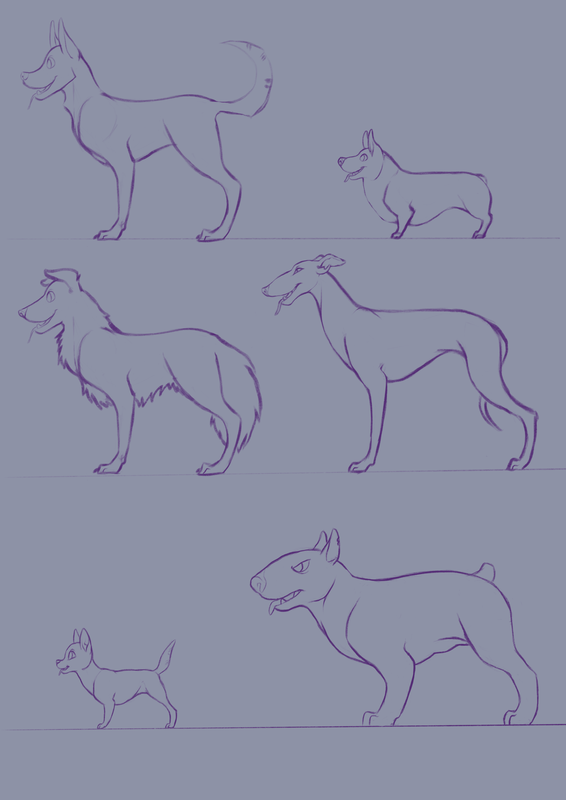 The curvy, snub-nosed mutt-looking fellow on the top left won out, as the name of the game here was to make a simple character that didn't need a load of alpha planes or fur plugins. 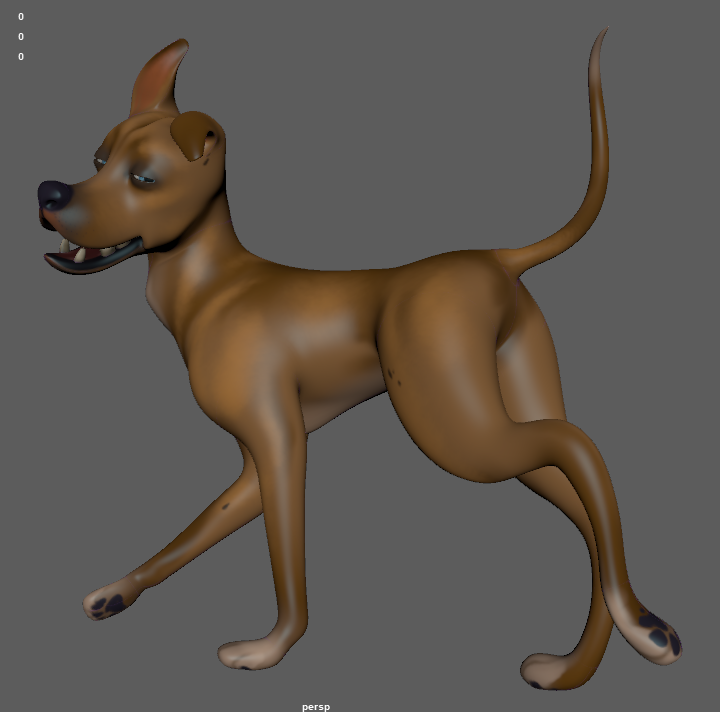 I started work right away, and within a couple days' worth of working on it in my free time, I had produced a model ready for rigging - the fact that I haven't rigged a quadruped yet wasn't going to stop me. 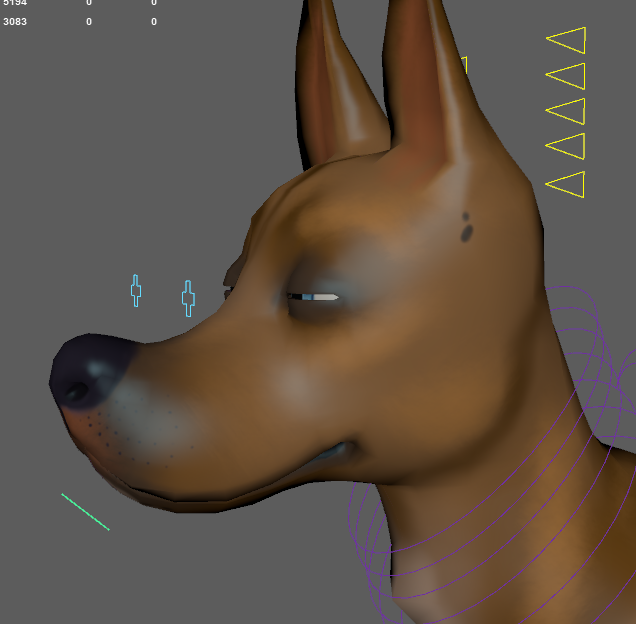 I really enjoy rigging and want to use this opportunity to learn! I took a slightly different approach to doing the eyes here. 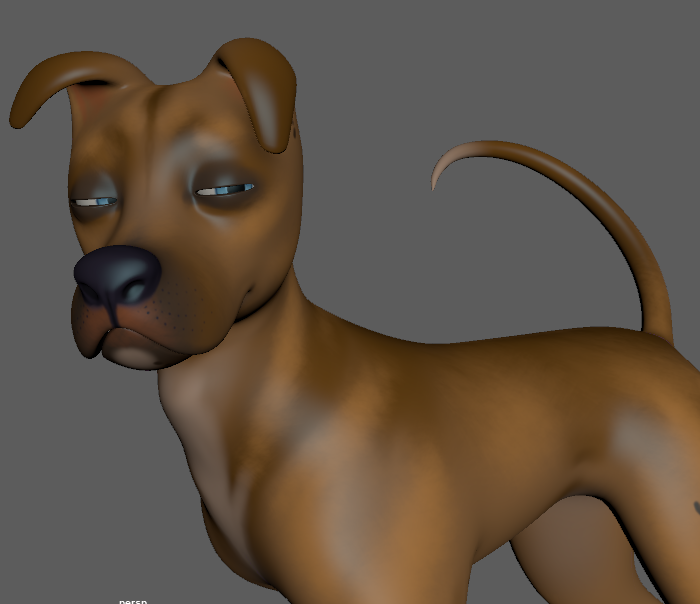 I saw that some artists who have done work for Disney and the like model their characters with eyes either fully closed, or nearly closed, for ease of use of the animator. Additionally the eyelids look better when they just have the geometry there as opposed to being wrenched downwards after having been textured. 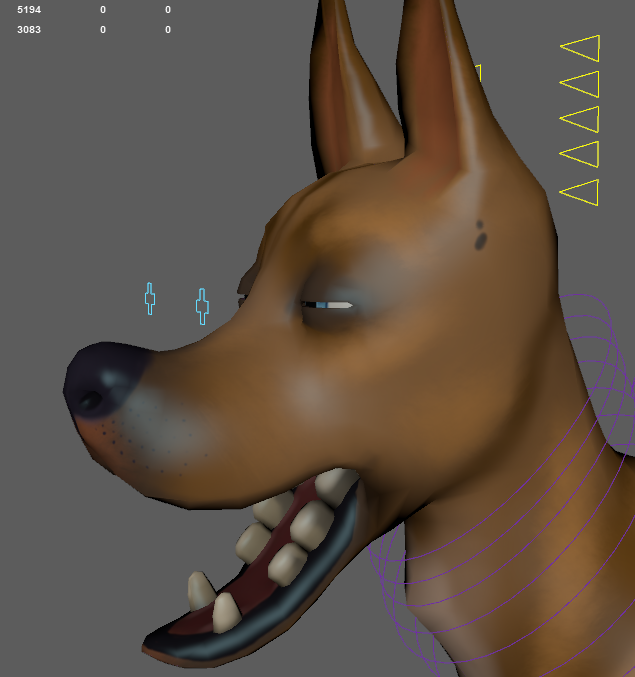 The mouth I modelled closed, then pulled it open and made the inside pocket - There were some issues with the corner of the mouth that I knew would require a blendshape or two to solve later on with the jaw opening. She's mostly ready now. A bit of weight painting to still be tweaked, but this is more or less right. 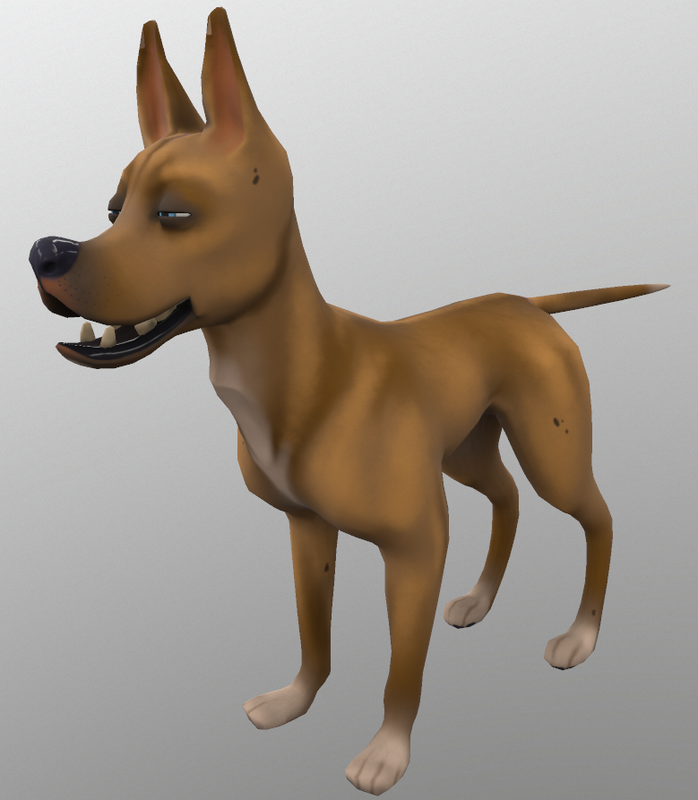 This is the model as it is more or less, with no effects other than Maya's basic viewport. She has an interesting little Point Constraint setup for the eyes so that they operate in tandem, but on opposite sides of the head. I need to find some decent subcutaneous reference of dolphin skin for a subsurface scattering map. 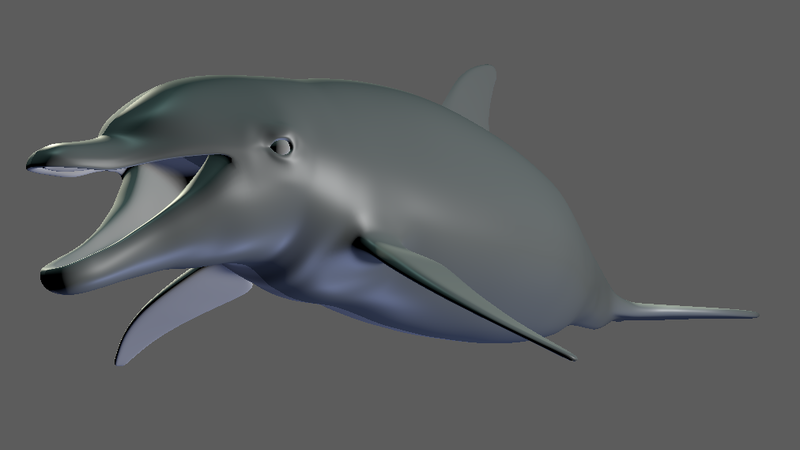 Going to teach myself some animation skills and how to use the Maya playblast, and then it's onto some space dolphin clothes! 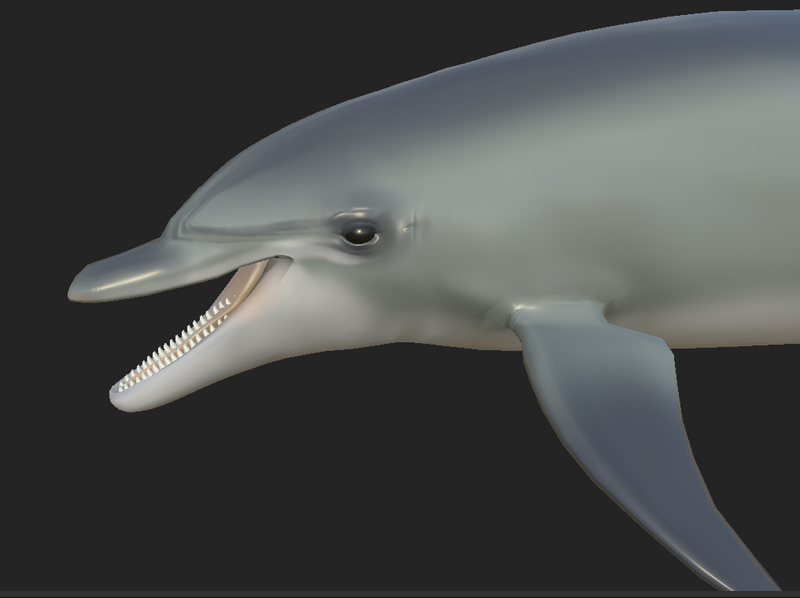 In a move that will surprise no one that is familiar with working on stuff they're using to improve their skills, my project has gone through some revision and not the least of which is the core dolphin model, the centrepiece of this diorama I am working on. 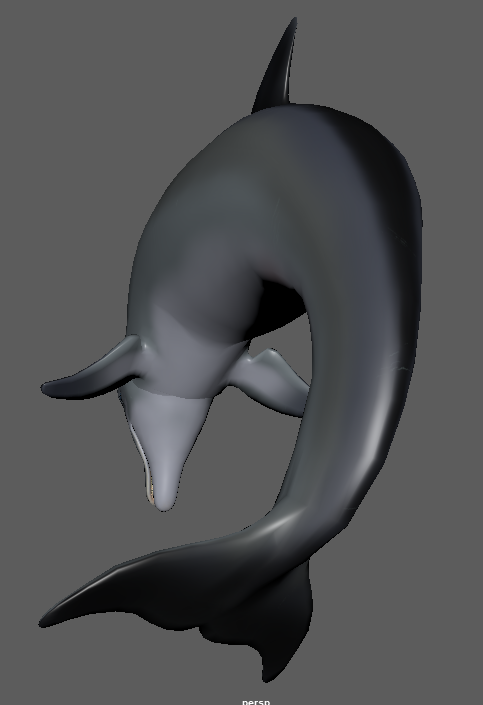 After soliciting some feedback from a few animator friends, I decided that the previous dolphin model was not fit for purpose and that its particular stylisation was not, after all, the direction I wanted to take this project in. 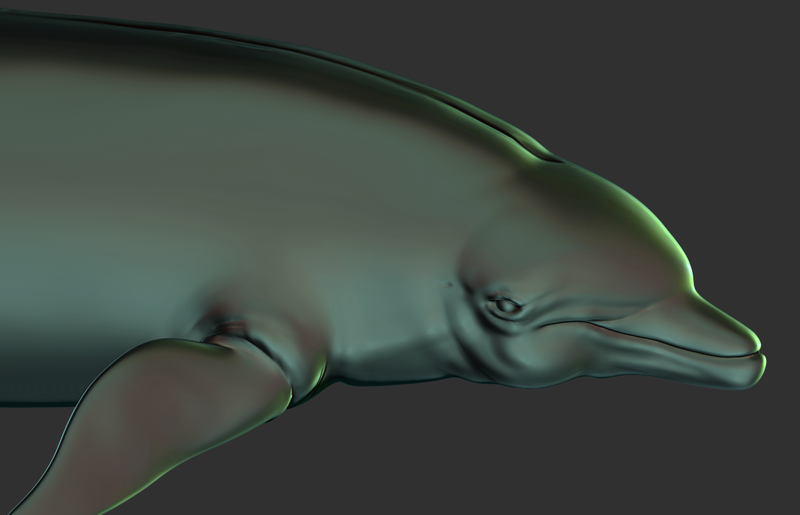 Whereas the dolphin before was slightly lumpy and exaggerated in its features, I decided to stick close to nature and I'm pleased so far with the result. 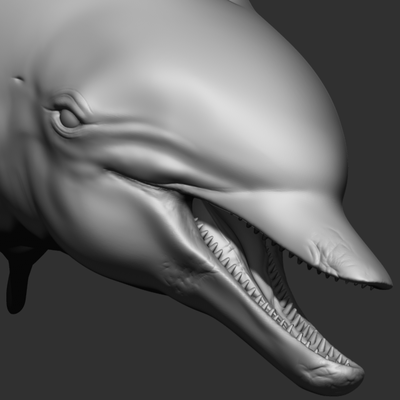 Something I've done a little differently this time from my usual workflow is that I made a very basic, proportionally correct dolphin shape with mouth closed and without any fins in ZBrush using Zspheres lined up with an orthographic reference. 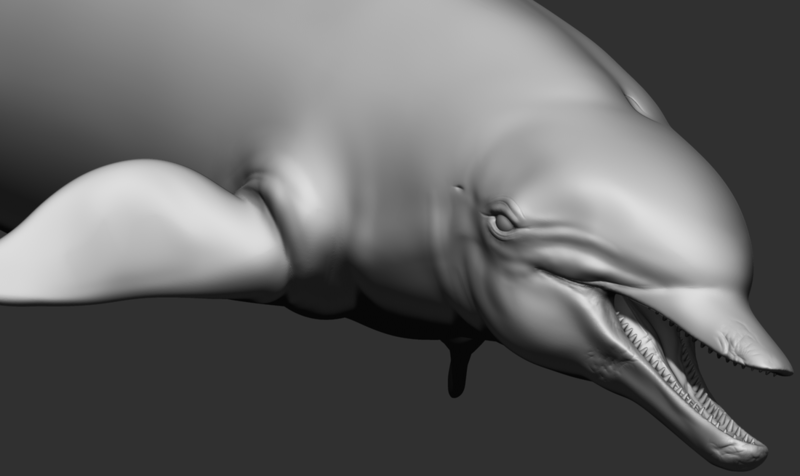 I refined the general shape, then exported the "body tube" for retopology. Once this tube was retopologised, I imported into Maya to start creating the fins and stitching them onto the form. This ensured the fins were all straight and tapered down in a nice, accurate way, and could be angled at precise degrees for rigging later on. With the limbs attached, I opened the mouth. Making sure to test periodically that the shape could still close consistently, I added gum ridges and bored a hole into the back of the throat in case I want to do any talking animations. I'm at the point now of creating teeth and tongue, then UVing can begin and I can pull her into ZBrush for some wrinkles, scars and fine skin detail. The tech stuff should be fun. ​After a pleasant and contemplative time in Norway visiting relatives, I'm back in the UK and starting to tackle my client work and projects again. One of the things I'm working on is a project near and dear to my heart. 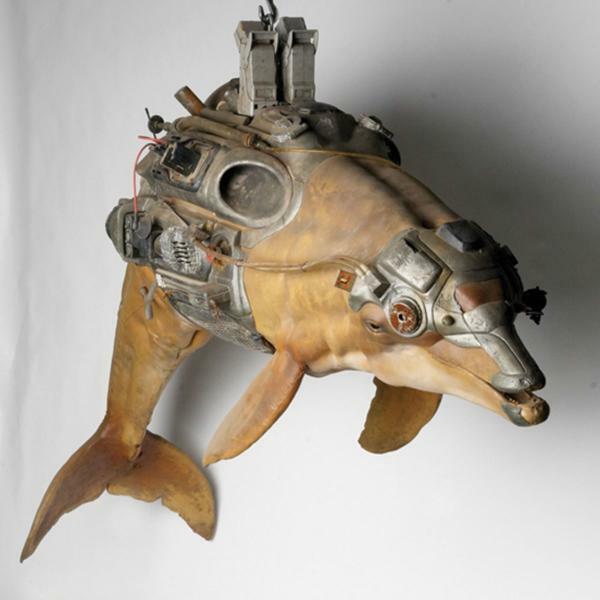 I've long been fascinated by dolphins in sci-fi and fantasy and read just about anything I can on the subject. Dolphins in space is a pretty common motif in my artistic life and occupied a strangely common presence in the 90s' creative aether when I was growing up, hence the name of my professional alias. 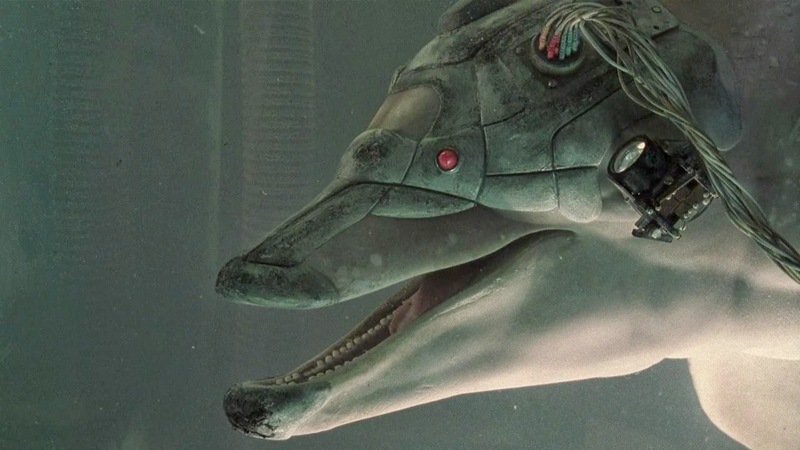 Whenever the aesthetic of sci-fi dolphins is brought up, Johnny Mnemonic (1995) is always mentioned, and rightly so. It's a pretty terrible movie and, by all accounts, a much better book. 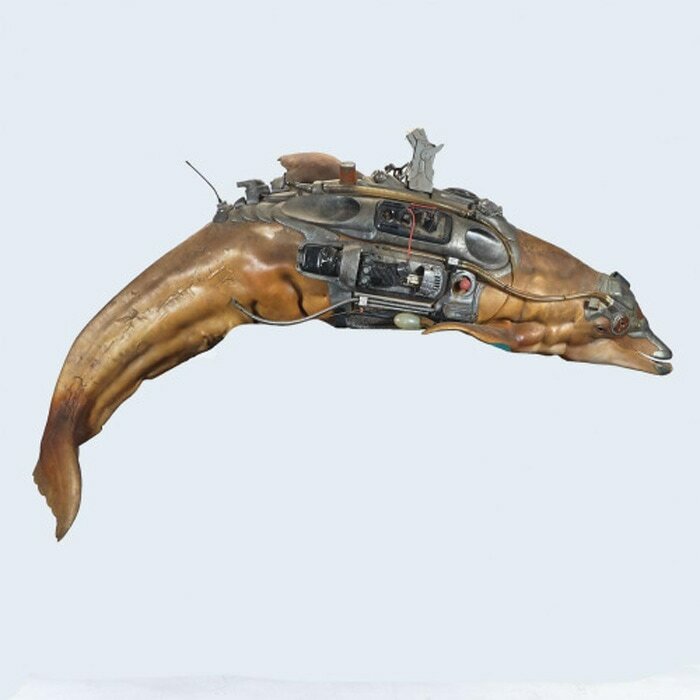 The thing that interested me most about it was the character of Jones, a cybernetically enhanced dolphin who spends his days jacked into the net, hacking it and doing whatever it is that dolphins do on the internet. I was inspired by the animatronic made by the good folks at FXSMITH Studio, and wanted to try my own hand at the idea. ​My final vision is going to be a dolphin in a tiny, cramped tank hooked up to an enormous spaceship's control room, serving as its "brain." There will be a window looking out into space, and the scene will be lit and rendered in UE4, all real-time. 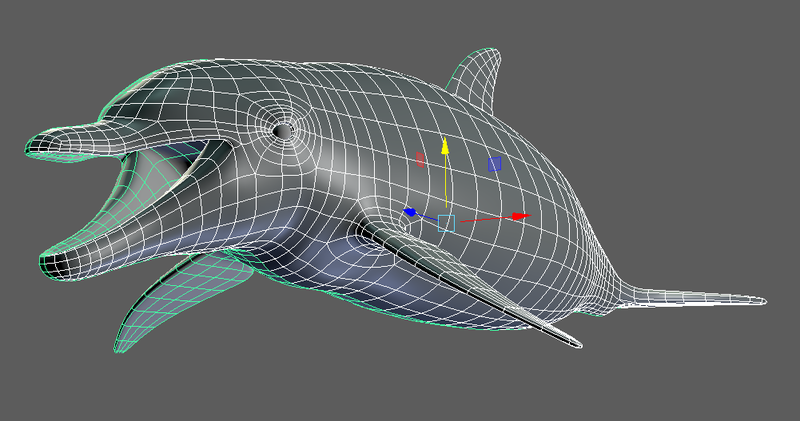 I will rig and animate the dolphin moving inside the tank. I've made some sketches about the room's look, but I've not settled on anything yet. 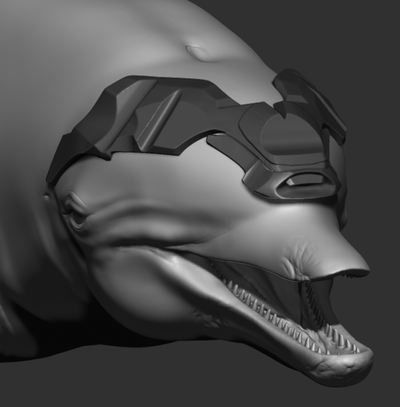 So far, I have created the dolphin and part of its headset. One thing to note is that the Johnny Mnemonic dolphin is not nearly as smooth as real life dolphins are - its bumps, curves and musculature are all exaggerated and stylised to varying degrees. 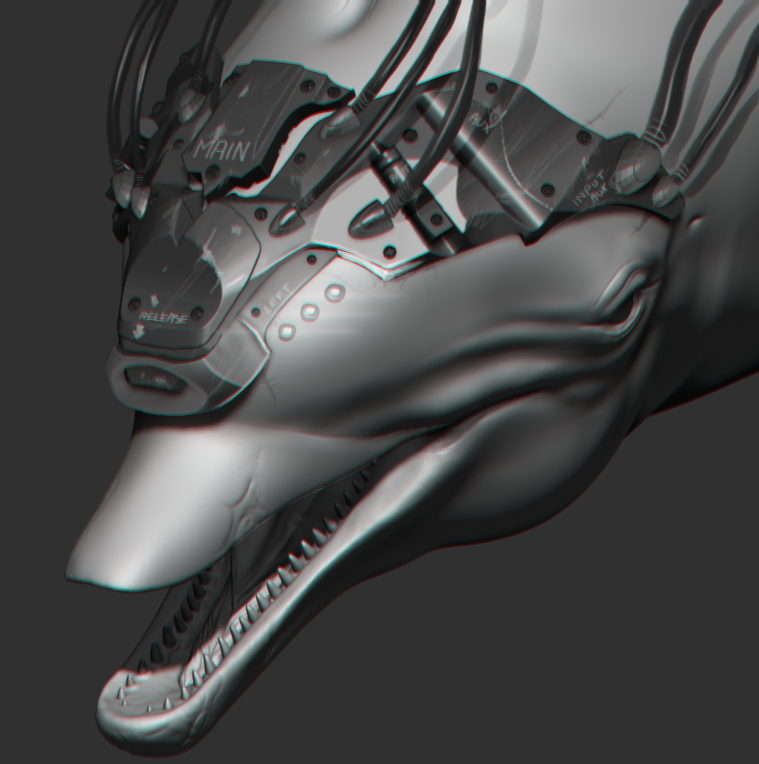 This is something I want to capture on my model as well, because I think it will catch light in more interesting ways than just keeping the dolphin slightly more true to life might. 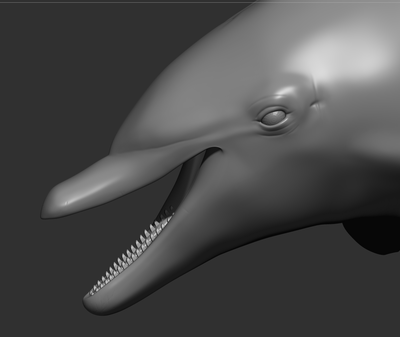 Having made the base dolphin out of Zspheres, I then wrenched the model's jaw open and began adding teeth and a tongue inside. 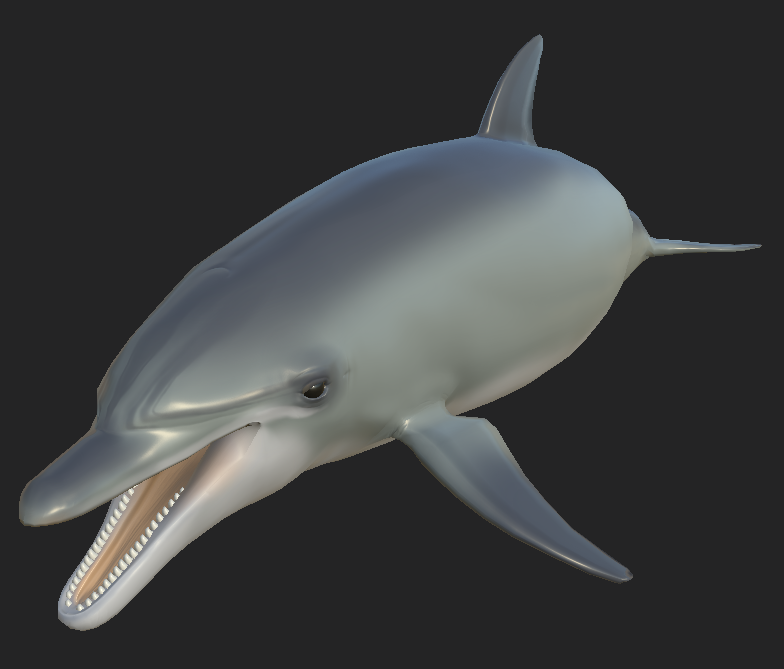 Bottlenosed Dolphins have between 80-100 conical teeth. My model does not have quite that many, but out of concern for the polycount I think that's forgivable. 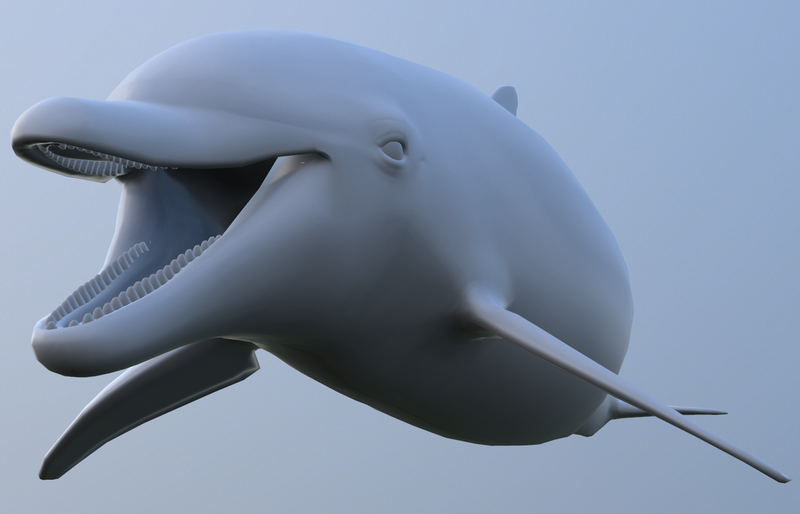 I have begun work on various mechanical bitty-bobs to put on the dolphin. 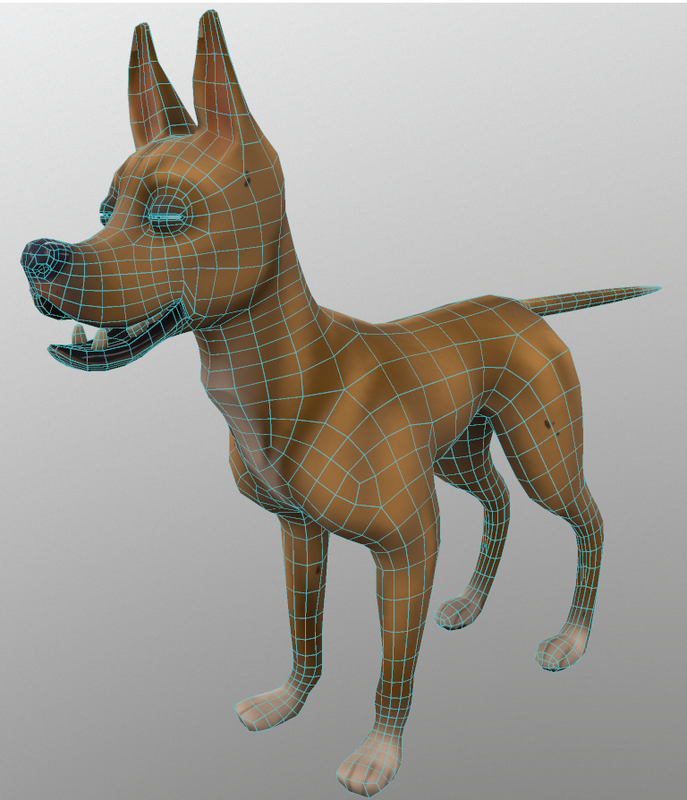 In the meantime, retopology on the main body has begun, and that's where I'm at. Those familiar with my work will notice my domain name has changed - don't panic, everything is as it should be. I wanted to provide a space for myself to keep folks updated of my current big projects and their progress, as well as any goings-on and industry shop-talk I might have to share. Right now, however, I have a flight to prepare for tomorrow, so the updates will have to wait until then!